IF we grab hold of our desire to create change in our lives and are willing to no longer be held back by the limitations of our comfort zone we are then able to truly begin exploring new and unknown horizons. My choice to put my fears aside (or at least in the background) and experience the Disney College Program was that first true step for me into the new and unknown. Not just surviving that experience, but embracing it in all its challenges put me on a new path. Over those short 4 months, I met the woman who would eventually become my wife. I met friends who I am still in contact with over 20 years later. Each of these people as well as those who only influenced my while there built into me new levels of confidence and depth to my identity. Because of that one decision to expand myself, there was now an underlying knowledge that I could and should be growing even further. Over the last 20+ years, I have grown in so many ways and done so many things I would have laughed at doing prior to these experiences. I've not only been married for 19 years (as of this writing) with infinite more to go, but I'm a father to 3 children! Talk about pushing your limits! Parenting is NOT for the timid and requires growth in maturity, focus, and commitment. I no longer allow the uncertainty and uncontrollable nature of new opportunities to hold be back from taking chances and reaching for new personal heights. Where previously I was so lacking in self-confidence it was hard to speak in front of a classroom of 15 peers, I now regularly teach group fitness classes. I have developed and present training curriculum to young men for a non-profit which mentors young men in our community. New challenges may still give me pause, but I no longer shrink from taking them on and seeing what happens. For example, I now regularly run obstacle course races including tremendous challenges such as Spartan races and the Green Beret Challenge race. I'm continuing to grow through the process of stepping out as an entrepreneur and building my own business helping others enhance their lifestyle to be their best and maximize their potential for success in all areas. Where previously I would have doubted my ability to be an authority on any subject, I not seek out one-on-one and small group opportunities to train individuals through exercise programming. Now, I actually (sort of) enjoy being in an environment where I am around people I do not know. I do not shy away from new conversations and meeting someone new. I'm not fearful to share who I am or what I do. Make no mistake, each of these things requires me to be intentional. If I allowed myself, I could easily shrink back to where my "natural" instincts may have me living comfortably in the safety of no personally emotional risk but that would ultimately be a prison of which I would be the warden and the prisoner. I must choose at each opportunity to accept the task of see where the path may lead. I don't allow myself to fear failure. I want to embrace it when it happens, to grow, to learn, and to use the experience so that it enable me to go further next time. Pursuing new horizons and venturing into the unknown requires me to be purposeful in my actions and decisions. Who I am now and where I am now would be but shadows of missed potential if I had remained who and where I was. If I had never accepted my responsibility for seeking growth and change I'd still be living small. My life would not be impacting anyone. Nothing and no one would be better for me being present. That is not the legacy I want. I want to keep pushing myself to be an example for my family, to be an encourager in the lives of others, to make a difference that lasts beyond me bing physically present. Life becomes exciting when we choose to exist beyond the comfort zone and on the journey to continued discovery of who we can become and what we can do. This is achievable for anyone, at any time, at any place. We may not be able to control what happens to us, but in truth we can control how we respond to it and how we allow it to either hold us back or fuel us with the fire to push forward. You my friend were created with purpose. You were created with intent. You were not meant to live a small, confined life. No, you were meant to shine even if it's just in your immediate sphere of influence. You were meant to impact and leave your mark in a positive way on the world around you. Start small. Where can you grow just a little bit? What can you do to move just outside of what's comfortable? 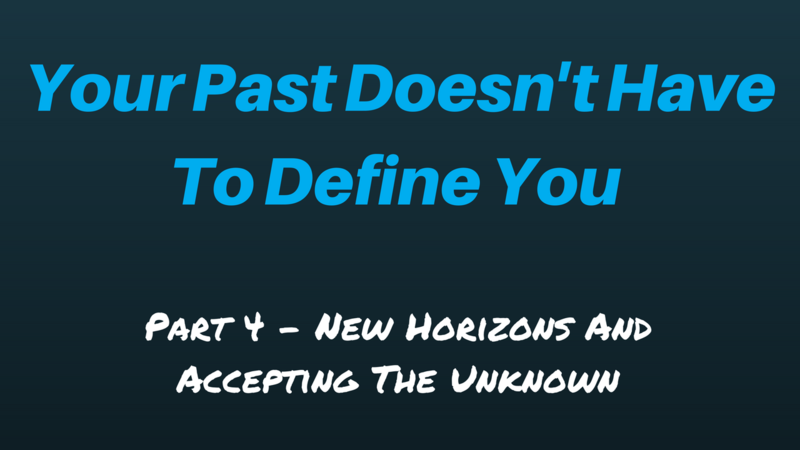 How can you take your past experiences that currently hold you back and use them as a fuel to catapult you out into something new and exciting? Embrace who you are and where you've been, but don't remain there. Don't live in the shadows of your potential. Burn it out. Give all you've got. Keep pushing yourself higher and higher. Seek new horizons and the unknown and never, ever be satisfied with where and who you are. Always seek growth until the day you pass from this world. To do less is to never know the fullness of your potential. Seek your best self each and every day, viewing new opportunities as possibilities and not obstacles. You can do it. If I can, you can. Live health. Love life. Always maximize your potential for success.